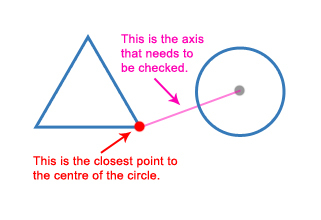 Separating Axis Theorem (SAT) is a technique for calculating collisions between convex polygons. I’m by no means an expert on it, but after the need arose for me to do some collision detection I did a pile of reading and finally got it working in ActionScript 3. When I found myself in a need to calculate collisions between polygons in flash, I came across a method known as Separating Axis Theorem (SAT). The only problem I had was that I really struggled to get a grasp on it. After a lot of reading about collision detection, and looking at code samples, it all finally clicked. To help out the other non-maths minded people I thought I would write this quick explanation to run through the basic principles of how it works. I’ve also included a demo using SAT collision detection, as well as some ActionScript 3 classes you can download and use. Note: SAT does require a bit of work with vector math, so it may be a good idea to brush up on your vectors before getting too far into SAT. Use your mouse to drag the shapes around. Whilst dragging, use the arrow keys to change the scale and rotation of the shapes. When the two shapes collide they will change colour (red) and show a possible reaction (grey). Basically, the goal of SAT (and every other collision detection) is to test and see if is a gap between two shapes. The method that SAT uses is what makes it unique. Imagine taking a torch and shining it on the two shapes you are testing from different angles. What sort of shadows would it cast on the wall behind it? If you work your way around the shapes and never find a gap in the shadows then the objects must be touching. If you find a gap, then they are clearly not touching. From a programming point of view it would be to intensive to check every possible angle. Luckily, due to the nature of the polygons, there is only a few key angles you need to check. The angles you need to check are the same as the sides of the polygons. This means that the maximum number of angles to check is the sum of the number of sides the two shapes you are testing have. Eg. Two pentagons would require ten angles to be checked. So how do you make it work in code? Step 1. Take one side from one of the polygons you are testing and find the normal (perpendicular) vector from it. This will be the ‘axis’. Step 3. Do the same for the second polygon. Step 4. Check the values you found and see if they overlap. If you find a gap between the two ‘shadows’ you have projected onto the axis then the shapes must not intersect. However, if there is no gap, then they might be touching and you have to keep checking until you have gone through every side of both polygons. If you get through them all without finding a gap then they collide. As an added bonus, if you keep track of which axis has the smallest shadow overlap (and how much of an overlap that was) then you can apply that value to the shapes to separate them. 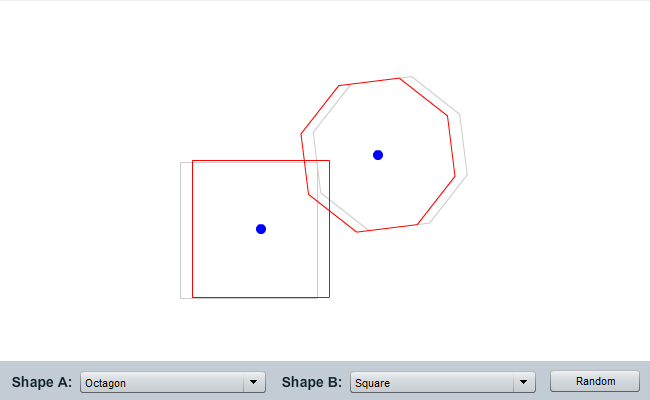 Testing a circle against a polygon in SAT is a little bit strange but it can be done. The main thing to note is that a circle does not have any sides so there is no obvious axis that you can test against. There is one ‘not so obvious’ axis you do need to test however. This is the axis that runs from the centre of the circle to the closest vertex on the polygon. After that it is just a matter of going through the usual routine of looping through every axis on the other polygon and checking for overlaps. Oh, and in case you are wondering how to project a circle onto the axis, you simply project the centre point of the circle and then add and subtract the radius. It is fast – It uses pretty basic vector math and you can bail out of a test as soon as a gap is detected, eliminating unnecessary calculations. It is accurate – at least as far as I can tell. It only works with Convex polygons – complex shapes are out unless you build them out of smaller convex shapes, and then test each individual shape. It doesn’t tell you which sides are touching – only how far they are overlapping and the shortest distance to separate them. There is probably a bunch more but these were the main ones I could think of. Here are a few links to other pages that helped me understand SAT collision detection. harverycartel.org – more detailed descriptions and some cool interactive examples. I learnt a lot from this page. GPWiki.org– good SAT explanation and sample code – I used this as a basis for creating my own code. GameDev.net forum – a SAT collision system a member created – gave me some ideas on how to calculate reactions, etc. If you want to see my AS3 SAT classes you can get them on GitHub. Basically, you create two shapes and then test them with the ‘Collision.test()’ method. If they touch then a ‘CollisionInfo’ object will be returned. If they don’t touch then it will return ‘null’. The CollisionInfo object has a bunch of information about the collision that can be used to separate the two objects, etc. This helped a lot. You should include that you have to cycle through all of the sides of that one polygon you choose in Step 1. From one “shadow” it could look like it’s colliding, but from a perpendicular, it might look otherwise. Explained in a very simple way. Liked it and will be referencing your article when I publish my own story. Hey Ant, sorry to hear that you are having trouble. When you say that you are you are using your own version, do you mean your own sat classes as well? Or are you using my code and it is not working? If you are writing you’re own, it could be a number of things – the thing that always tripped me up was that I always forgot to convert the vector normal to a unit vector before projecting the sides of the polygons. I’m writing an implementation of this, and I can’t figure out how to find the vector that separates the shapes (called collisionInfo.separation in your implementation). Having just read through your version, trying to write your way of finding it, and watching my two shapes fly right through each other, I was wondering if you could provide some light on this topic. The problem seems to be that the axis given for separation is the wrong one, any help? I had a quick look at the implementation you posted. It appears to be checking for a collision only, and not actually figuring out how to separate them. If you were to use the ‘axis’ property directly after that method you would always get the last axis that was tested, which is not necessarily the the shortest path of separation. To get the right axis, you would have to keep track of which axis had the shortest amount of overlap. This should be as simple as having another vector variable declared and checking it each time an axis is tested. If you get to the end and there is a collision, simply use the vector you have stored for the separation. At least, that is how my code works. In your first sentence you talk about concave polygons instead of convex ones. The axis to be kept is the one which has the minimal overlap (not the greatest). Anyway, really nice work ! Great post…question, I used your code as a basis for my own SAT test..question though–what is the purpose of sOffset and vOffset? Intersection tests in my version, work perfectly, without using either of these. Hmm – good question. Its been a while since I wrote it so I had to have a look at the code again. This is a great explanation, thanks! In fact, now I have some feedback: it would be worth emphasizing more that it’s necessary to use normals from *both* polygons as axes. I totally understand whats going on, its just I dont know how to put this in code, I give this tut a 90% ( which is great ) but if you put a little code under each step, (especially when we create the “axis”) this would get an instant 110%. You wont have to reply to this, ill just spend an hour on google, but future viewers will want the same. Thanks a lot, this has been really helpful! Thanks for the article it was really helpful in better learning of SAT. Thanks for this powerfull code. It will be very helpful to me and I see I am not the first. I was looking for solid explanations about SAT and thanks to you, I know this is exactly what I should use. Please, could you publish source code of the above demo ? I tkink it would be easier for everyone to use your library in the future by analyzing this example. 3) I can work out the point that’s closest to the other shape on one object. 4) I can use that point and the hypot to create a plane (using a line equation) that sits against my first shape but perpendicular to the hypot. 5) And then I can test if any points in the other shape are beyond that line – maybe by checking against the lines normal value (dot or cross product – I always get them confused)? I don’t know if that’s any faster – just musing. Seems like more math but less work and no loops? I agree with meming – Great tutorial, but a simple useage example is always nice! I can get circle and box working, but not polygon. How do I create a basicPolygon? In your article you mention that this technique does not provide the features of the two colliding objects. This is not true. This technique can be easily extended to provide the features of each object for further processing i.e. finding actual contact points. i completly agree with meming. when he said u should write down a little code after the line. i understand everything except the axis part. I understand it. I just dont know how to put it into code. Your work can be completed with my theory. I read several articles on this topic before coming here. This article is the first one where it all really started to click for me. Thank you! ||(P0 + tV0) – (P1 + tV1)|| = R0 + R1 where the distance between the centers of the interval extents of your smashed points is equal to the sum of their radii.